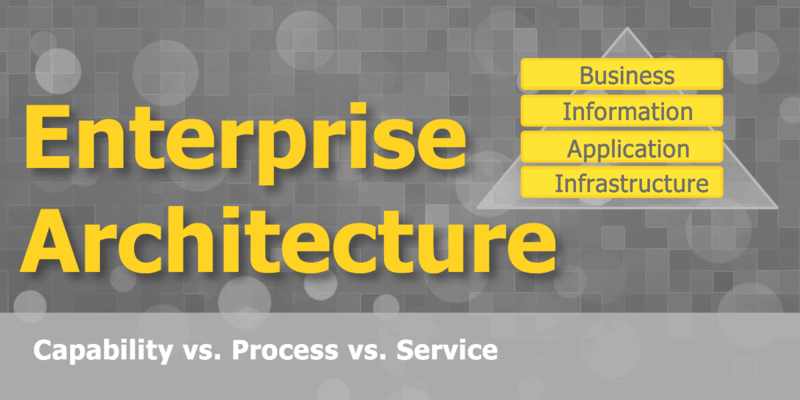 The terms Process - Capability - Service are important terms in today's Enterprise Architecture landscape. However a clear definition of how these terms related doesn't exist. Hopefully this post will help you with this. Process vs. Capability: generally agreed definitions are that process is the how and capability is the what. These seems to be generally accepted by the industry. So let's simply adopt this as a part of our shared definitions. As stated the harder part is Capability vs. Service. What has been agreed by industry so far is that they are both considered what's. Also both are also defined as having a specific outcome. So what is the difference? The only distinction between Capability vs. Service is that Service is considered an access a.k.a interface. They are both whats with a specific outcome. Coming up with clean simple definitions is not easy but can be very powerful when done right. So the terms we landed on are below, hopefully this can help someone else needing to define these terms and/or integrate ITIL & TOGAF.